As good as the UT defense was this year; I have a feeling it will only get better. Tampa Bay Buccaneers defensive coordinator Monte Kiffin will be joining his son Lane at Tennessee, sources told ESPN senior NFL analyst Chris Mortensen. 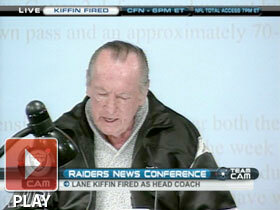 Al Davis reads the letter he sent to Lane Kiffin. One of the stumbling blocks that led to the demise of Lane Kiffin in Oakland with Al Davis was that Kiffin wanted to fire defensive coordinator Rob Ryan and hire his father Monte of the Bucs -- the highest paid defensive coordinator in the NFL. Tennessee has reached an agreement with Lane Kiffin to take over as the Volunteers' next coach, with an announcement planned for Monday, barring any snags, according to multiple sources. Sources confirm to ESPN that his 68-year-old father plans to join his son after the Bucs' season. Kiffin once introduced a more aggressive national recruiting plan to USC and he recruited ex-Vols great Peyton Manning, who was consulted by his alma mater and signed off on Tennessee's hiring of Kiffin, sources told ESPN. Great news for Vol fans.